All dog walkers and pet sitters in Carrollton are employees of DFW Pet Sitting. They are bonded and covered by our liability insurance. We employ pet lovers who work in their immediate neighborhoods, usually within 5 miles from where they live. Our company monitors each and every assignment. Manager or owner are on call 24/7. All dog walkers and pet sitters in Carrollton live in your neighborhood near you. Finding a company that is reliable, local, established and professional will make your travel easy and worry-free. With the best dog walkers and pet sitters in Carrollton, we are here to offer you a worry-free pet care experience. Carrollton, North Dallas, Hebron, and Farmers Branch are major areas that our Carrollton pet sitters covers. Your pet sitting and dog walking professional won’t drive too far to get to you, and you know: if it’s convenient for your pet sitter, you’ll have fewer reasons to worry that they will let you down. Plus, the manager on call monitors each pet sitter’s activity, and we make sure the schedule is followed thru. We offer pet sitting and dog walking services in all zip codes of Carrollton and all surrounding areas. Our dog walkers and pet sitters in Carrollton stay in their immediate neighborhoods and focus on quality pet sitting. Carrollton is a fast-growing suburban area. It is a very nice combination of a busy city and a calm and quiet nature. You’ll see lots of busy professionals walking their dogs or looking for cat sitters in Carrollton. 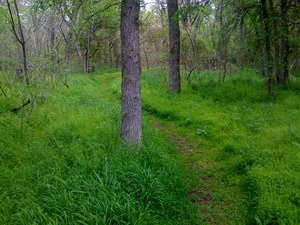 The Elm Fork Nature Preserve was purchased by a local Texas family back in 1861. It’s 40 acres of trails, wildlife, and natural north Texas beauty. A preserved microcosm of what Texas in this area must have looked like before the population moved north out of Dallas. It’s a day of semi-seclusion for Carrollton pet sitters and dog walkers to explore and behold the delicate ecosystem of a natural preserve. Bring your furry friends out for a walk but make sure to keep them leashed as you don’t want to upset the virtually untouched natural landscape of this area. This is a place to stimulate your dog’s senses but also a place to reflect and breath in the natural beauty Mother Earth. It’s in the heart of Carrollton, not a far drive from any point. Grab a leash and get out for some fresh air. Check out what makes Carrollton pet sitters and dog walkers happy about DFW Pet Sitting! It’s fun to have the opportunity to hang out with different kinds of cats and dogs. It also makes me happy to know that the clients’ pets content, safe, and relaxed while being under our care. Thanks, Jennifer, keep it up! !